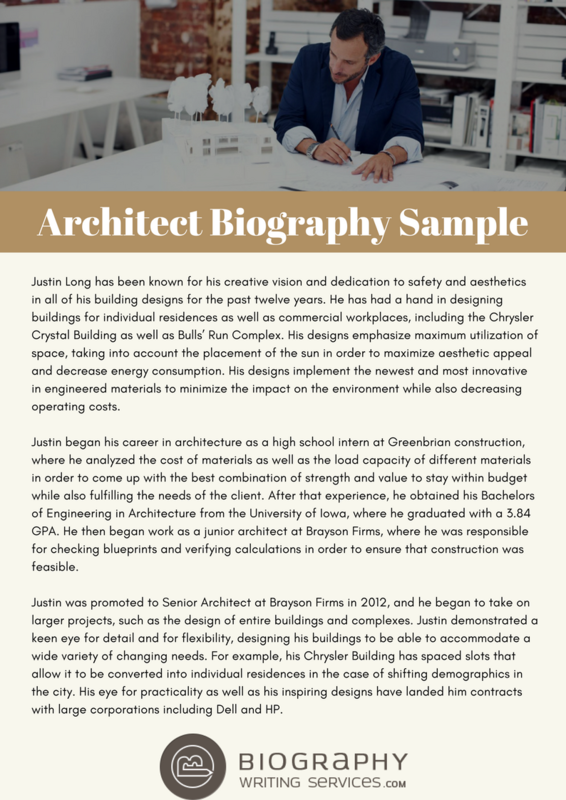 One of the best ways an architect can effectively market themselves is with their biography. 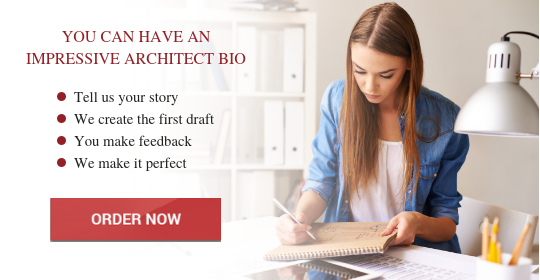 Architect information such as professional history, major career accomplishments, experience, and qualifications are quickly conveyed through their bio. The bio allows more of your personality to be seen than a resume does, and focuses on career highlights as opposed to providing a complete professional history. 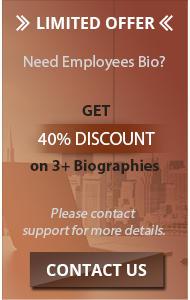 The first steps in creating your own bio occur before you even begin to write involve answering three questions. What purpose is your architect bio meant to achieve? Who is the intended audience? What impression of you is the bio supposed to give to the audience? It is important to determine the answers to these questions if you want your bio to be effective. A biography writing sample can help you. Once you have determined the answers to the above questions it is time to select what information to include in your bio. You should include information taken from your professional work history, educational background, notable achievements, and industry affiliations. You won’t be able to include everything so select information from each area that is relevant and helps in achieving your intended purpose. Once you have determined what information to include, the actual writing of the bio can begin. Well, using our bios can be shared on many platforms for best results. These platforms can be Facebook, Instagram, and website. Instagram is something different from Facebook. Do you know that old saying? One picture can value 1,000 words. Instagram is that social media toll which has actually taken this concept. So, you can use our services for an Instagram bio for architecture student as well. Your Instagram Bio is the most important aspect of this social network. It doesn’t in fact matter for what your account is, whatsoever you’re doing, your bio would be the first thing that your likely followers are gonna see. No wonder why so many people prefer hiring a professional biography writer for various business and personal needs. Professional employment history. Discuss past jobs that are relevant, beginning with the most recent first. Education. Provide information on college/university degrees you hold and the institution granting the degree. If you have any special certifications that are relevant, include them also. Personal information. Conclude with one or two bits of personal information. It makes it easier for readers to see you as a person and can be the basis for making a connection with the reader. Contact info. This format starts by providing the reader with your name and the type of work you do. It then establishes your credentials that show you are well qualified to provide this type of work. Your experience, education and industry affiliations all help establish credentials you possess in the industry. Use clear and concise language. Don’t include unnecessary words. Proofread your bio to ensure there are no spelling mistakes or grammatical errors. Contact us for a well-crafted architecture professional bio designed by our experts to achieve its intended purpose and create the impression you want!